“It would just take a small Ping — the whole thing could shatter and fall apart” he said. I thought, yes, just like the edge-of-chaos/order: a phase transition. Soon it happened. Few, if any, but Karel could have imagined it happening — and so soon. He knew the system well: as a kid, he had been prevented to pursue what he was good at — mathematics — for the powers of Czechoslovkia wouldn’t let him go to school, because his father had escaped from the Soviet bloc, leaving Karel and his mother to suffer the consequences. Karel knew what it is like not to trust anybody outside his immediate family — not say what everybody knew but could not say — the Soviet system was a human prison: Private Truths, Public Lies. Karel did get out in 1978 by Jimmy Carter’s diplomatic initiative with Alexander Dubček’s short regime. Only a few could escape from the system. Karel obtained his PhD in Mathematics from Stanford University a couple years later after our talk. Nobody really thought it would happen. The Iron Curtain seemed still solid in 1988. The Soviet system had lasted for more than 75 years. The Soviet Union was one of the two superpowers: a military and nuclear super power. Rebellions had failed before: Hungary and Czechoslovakia, otherwise subversive acts had to keep a low profile. The first real crack on the surface of that Curtain had started in 1982, three years before Mikhael Gorbachev took power. That first crack, that finally spread like that imagined shattered glass globe of Karel’s in 1989, was Promoted by one man…. It was a small crack, that almost closed up and died. But he couldn’t have done without a little help from his friends — and his enemies, and those in between. It was a very very hard sell at the time. The Ghost of Khan still had a grip of that Gdansk’s Lenin shipyard, with the Polish United Workers Party, and Wojciech Jaruzelski at its head. Lech Wałęsa, Promoter Artisan, (born 29 September 1943) is a Polish politician, trade-union organizer and human-rights activist. 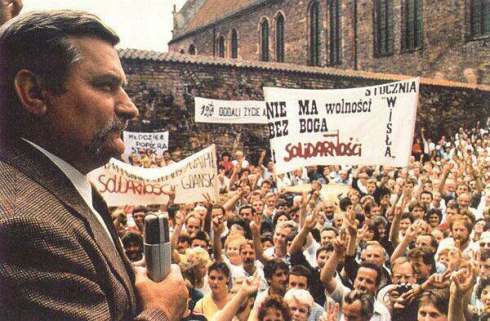 A charismatic leader, he co-founded Solidarity (Solidarność), the Soviet bloc’s first government independent, trade union, won the Nobel Peace Prize in 1983, and served as President of Poland from 1990 to 1995. In the 60’s and 70’s the Soviet Leaders, notably Leonard Brezhnev, maintained a tight political grip on the Warsaw Pact through its puppet bureaucratic leaders like Jaruzelski, Honecker, Ceaușescu, Zhivkov, and Kádár. The Soviet system had used political and “legal” repression and the threat of military intervention to keep the Pact behind the Curtain, but with the rapid succession of deaths in the aging Soviet political top, new kinds of leaders could emerge from that stagnant chaos. Margaret Thatcher was the first leader from the West to recognize Lech Walesa’s Solidarity. She had been fighting the the legal, established, and entitled governmental and union elites of Britain. Arthur Scargill, the British union leader of the National Union of Mine Workers (NUM), had long criticised Poland’s Solidarity trade union for its attacks upon the communist system in Poland. Later it was revealed Scargill’s feather-bedding and hypocrisy was over the top. It was NUM’s general secretary Chris Kitchen, who said, “I honestly do believe that Arthur, in his own world, believes that the NUM is here to afford him the lifestyle that he’s become accustomed to.” For years the NUM had been paying £34,000 annual rent for the flat on Scargill’s instructions, without the knowledge of NUM members or many senior officials; Scargill claimed the NUM should continue funding his flat for the rest of his life, and thereafter for any widow who survived him. Chris Kitchen said: “I would say it’s time to walk away, Mr Scargill. You’ve been found out. The NUM is not your personal bank account and never will be again.” Lech Walesa, a trade unionist under the boot of communism, had a different experience and point of view. “When I look back upon those momentous days of the late 1980s, the liberation of Eastern Europe from communism, I know that Solidarity started something at the Gdansk shipyards that triggered a domino-effect of change behind the Iron Curtain. Without Solidarity it would not have been possible. And Solidarity’s strength came, quite literally, from solidarity – from the determination of Poles to stand together in a common struggle: workers and intellectuals, believers and non-believers, young and old. That was the first step to victory. But on its own it would not have been enough. Without Solidarity’s friends in Britain, the changes we wanted to achieve would not have been possible. Because for us it was also vital to know that our fight had the support of the democratic world. Margaret Thatcher’s support was crucial. She had always been among our friends, and in those dark days she showed it. In 1988 we were very weak after years of fighting under martial law. We needed help. Then Margaret Thatcher came to visit me and Solidarity’s other leaders in Gdansk. Although nobody knew it at the time, with Mikhail Gorbachev taking power in the Soviet system in 1985, that the shattering of the Curtain would come soon, for Gorbachev would not use the Soviet military or authorize Pact “leaders” to repress their own people. Once most people in the Warsaw Pact nations knew that change was possible, cracks under the power structures would grow bigger and bigger. Lech Walesa served as one of the first of the most visible cracks. At the celebration of the reunification of East and West Germany, Lech Walesa suggested that the future of a united Europe should be built on the foundation of truth, not on lies. With this assertion, he added that the historical truth was that freedom for East Germany was not due to politicians alone. 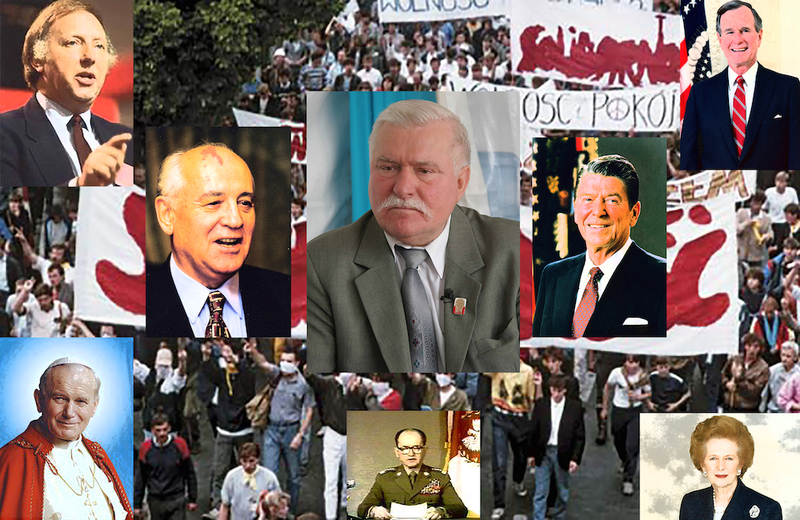 “Truth is very important when we speak of the course of history,” said Walesa. He suggested that the fall of the Iron Curtain was due in a large part to Pope John Paul II and the Solidarity labor movement. At the celebration, German Chancellor Angela Merkel and former Soviet President Mikhail Gorbachev also walked across the old border, along with Walesa, at the site where some 136 people were shot since the erection of the wall in 1961. The Polish Pontiff’s trip to his native country in June of 1979 made a great impact, as it was the first visit of a Pope to a Communist country. 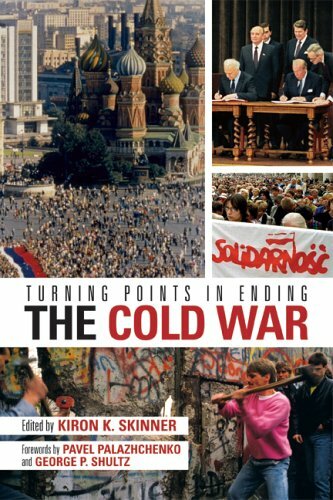 With Yeltsin and Gorbachev at the helm in the Soviet state, and support of John Paul II, Margaret Thatcher, Ronald Reagan, and lastly with George H. W. Bush not crowing for America’s triumph over the Russians in the Cold War, the people of Europe, following Lech Walesa’s lead, shattered Iron Curtain. Recently, Walesa has reminisced and pronounced that Poland has had a complete political transformation from communism to democracy.